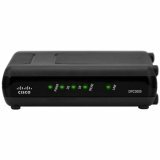 The Cisco DPC3000 DOCSIS 3.0 cable modem is prepared for internet speeds up to 160Mbps and up to four times faster than a single-channel DOCSIS 2.0 cable modem. However, this modem is still considered low speed compared to newer modems as the DPC3000 only has 4x4 bonded channels. This modem also has only one Ethernet port and is one of the cheapest on the market if you’re looking for a cost-effective solution for replacing a cable service provider’s rental.